"I've become fascinated with tracking Archie, but it is so worrying." Many notable individuals and organizations long have touted the benefits of modern technology but when it comes to improving the lives of cats their proclamations ring especially hollow. That is so much the case in fact that an even stronger argument could be made that irresponsibility to cats and technology go hand in glove. 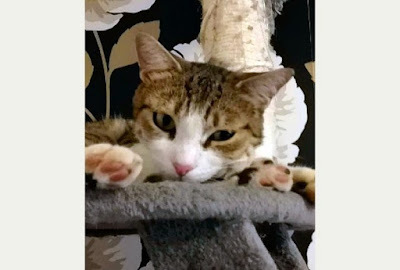 A good case in point is how that Iain Simpson and Clare Smith from the village of Quarrington in Sleaford, Lincolnshire, so outrageously neglect the personal safety of their four-year-old, brown and white resident feline, Archie. Not only do they permit him to stay out all night unchaperoned but they additionally allow him to go AWOL for weeks at a time without, apparently, even so much as bothering to search for him. Instead of availing themselves of the only morally acceptable option open to them, which would be to lock him up indoors overnight, they instead have elected to invest £49.95 in a G-Paws satellite tracking collar. 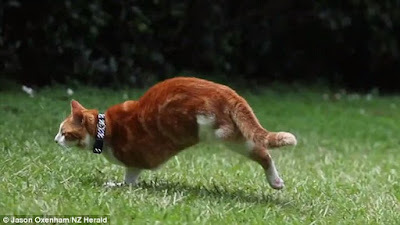 Lightweight, waterproof, and with a battery life of up to eight hours, these devices are capable of recording the minute details of cats that like to roam and their findings later can be downloaded onto maps. They additionally are equipped with motion detectors which automatically shut them off once a cat comes to a complete rest for longer than five minutes and that in turn also helps to extend the lives of their batteries. So far, more than five-hundred of them have been sold in the United Kingdom. As the result of surveillance data gleaned from one of these devices, Simpson and Smith soon learned that after Archie leaves their house at night he walks six kilometers to the busy, two-lane A15 motorway, which stretches one-hundred-fifty-three kilometers from Peterborough, Cambridgeshire, in the north to Scawby, Lincolnshire, where he apparently lies down in traffic and sleeps for two hours. Leaving aside for the moment that it is a miracle that he already has not been run down and killed, such a revelation would be more than sufficient not only to scare the bejesus out of any genuine cat-lover but, more importantly, it would prompt drastic remedial action. As difficult as it may be to believe, that has not occurred; on the contrary, Simpson's reaction to that shocking revelation has been pretty much confined to mild bemusement. "I've become fascinated with tracking Archie, but it is so worrying," he conceded to the Sleaford Target on March 20, 2014. (See "Britain's Bravest Pet: Missing Cat Sleeps in the Middle of A15, According to Archie's GPS Collar.") "It's like worrying about a teenager on a night out. I know he's gone but he'll never tell me where." It is because of G-Paws' motion detector that Simpson learned that Archie spends hours on end on the A15. "He's a fearless tyke really. The data from his tracker shows him being stationary in the middle of the road for hours at a time," he added to the Sleaford Target. "I can only assume he's gone to sleep. Maybe the sound of traffic relaxes him. I don't know." Since he quite obviously knows where Archie is hanging out, the responsible thing for him to do would be to go and collect him. Sadly to say but Simpson has proven himself to be totally unwilling of doing even that much for his cat. "I do know that he always comes back in the morning for his breakfast, none the wiser that I had been absolutely terrified for him," is how that he casually sloughed off his reprehensible lack of action to the Sleaford Target. "He's probably Britain's bravest pet. He's certainly braver than me." 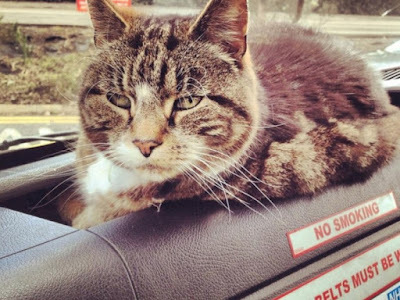 That is because Archie is totally unaware of just how lethal motorists are to cats. It accordingly is Simpson's and Smith's job to protect him from their machinations as opposed to reveling in his deering-do. G-Paws' creator, Dave Evans, is equally callous. "This just goes to prove the secret lives of our pets is (sic) much more diverse than we could ever could imagine," he gleefully crowed to the Sleaford Target in between, no doubt, salivating over all the money that he is making from the sale of his tracking devices. Whereas multitudes of owners condemn their faithful companions to early graves by either wittingly or unwittingly allowing them to venture out into traffic by their lonesomes, this is the only second known example on record whereby one of them has knowingly turned a blind eye to a cat that makes a habit of sleeping in the middle of a busy street. The first such incidence concerned a fifteen-year-old, one-eyed female named Krümel ("Crumb" in Deutsch) from the old Hanseatic city of Hattingen in Nordrhein Westfalen. That petit fait has been demonstrated most conclusively in Archie's case where his owners have failed to act in spite of having been warned of the imminent danger that he is in by a tracking device. It accordingly is safe to conclude that if cats are to be protected it is not going to come courtesy of technological advances, but rather through the gift of caring and conscientious guardians. As far as Archie is concerned, no additional articles about him have appeared online so it is not possible to say what ultimately become of him. Nevertheless, unless Simpson and Smith had an abrupt change of heart and belatedly decided to keep him out of the dangerous A15, it is very doubtful that he is still above ground. 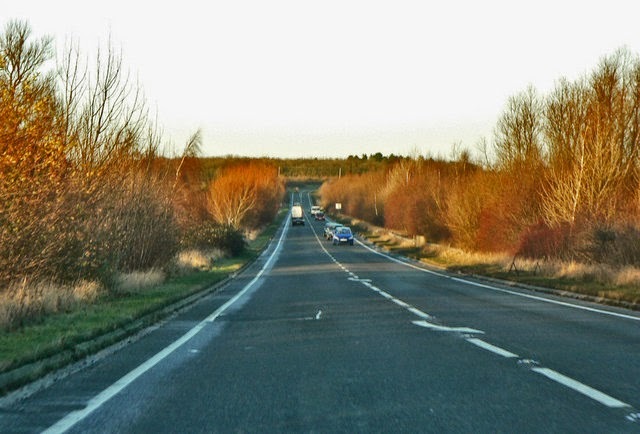 Photos: the Sleaford Target (Archie) and Mike Lobb of www.geograph.org.uk (the A15). "I stopped counting at NZ$22,000. It sure is a lot of money but putting Simon down wasn't an option. He's part of our family." Shelters, Animal Control Officers, veterinarians, wildlife biologists, and ornithologists kill cats in droves. Even a vast majority of owners have their faithful companions unceremoniously liquidated as soon as they become either old, sickly, or their presence is simply no longer desired. Mercifully, that is far from being the entire story and Robert McCarthy from Auckland is a bright and shining exception to that rule. Three years ago, he and his wife, Madeline, opened up their hearts and home to a three-legged ginger and white tom named Simon. 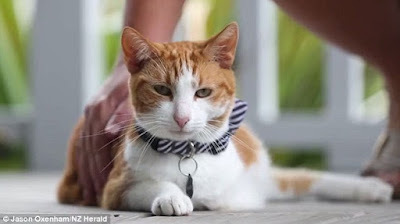 "When we first met him at the (Royal New Zealand) SPCA we didn't even realize he was missing his back left leg," he told The New Zealand Herald of Auckland on March 5th. (See "Meet Simon: the $22K Two-Legged Cat.") "He moved around just like any other cat; it didn't affect him at all." It has not been disclosed either how that Simon lost the leg or why that he wound up at a shelter in the first place but, needless to say, both near-death experiences constitute more than enough tragedy for any one cat to bear. Sadly, in his case The Fates, never seemingly able to leave bad enough alone, had even more miseries in store for him. The next installment of their devilry occurred last June when he was nearly mauled to death by a neighbor's dog. The specifics of the attack have not been publicly divulged but McCarthy first learned of it courtesy of a telephone call that he received from his local veterinarian. It therefore is assumed that either the dog's owner or a Good Samaritan collected Simon and took him to the vet. McCarthy in turn likely was tracked down by information contained on either his collar or, more likely, from an implanted microchip. 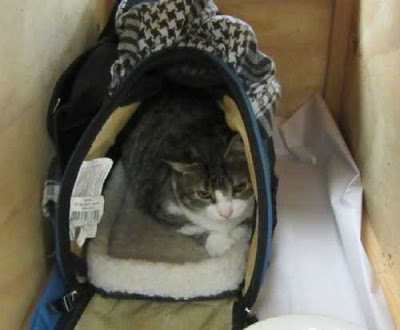 Suffering from multiple wounds and fractures to his left front leg, Simon was promptly transferred to the Veterinary Specialist Group in the Mount Albert section of the city where he underwent emergency surgery in a desperate attempt to save his leg. Sadly, an infection set in immediately following the procedure and that necessitated its removal. There can be little doubt that his surgeon, Kyle Clark, wanted at that juncture to snuff out his life but McCarthy and his wife were not about to go along with that. Since their beloved cat have coped well while his injured leg was in a cast, they reasoned that he could get by without any appendages on the left side of his body. "When his leg was in a cast he would tuck it up and not even use it, or he would use it like a crutch, so we knew he would cope okay," McCarthy told The New Zealand Herald. Even so he surely must have had some inner doubts but Simon soon silenced them by getting out of bed and taking a few tentative steps the very next day after the leg had been removed. A few weeks later he was behaving as almost nothing had ever happened to him. "He bounced back in no time and was tackling everything from stairs to jumping on the couch and the beds," McCarthy proudly pointed out to The New Zealand Herald. Saving Simon has not come cheap, however. For instance, the first operation in order to try and save his leg cost the McCarthys NZ$7,000 of which their pet insurance paid only NZ$3,500. His stay in intensive care, antibiotics to fight off various infections, the treatment of other undisclosed maladies, check-ups, and the dressing of his wounds cost the couple several thousand additional dollars. On top of all of that, there was the cost of amputating his leg itself as well as his recuperation. "I stopped counting at NZ$22,000 (US$15,360, £12,425, and €14,308)," McCarthy disclosed to The New Zealand Herald. The money is immaterial, however, and McCarthy is anything but crying in his beer. "It sure is a lot of money but putting Simon down wasn't an option," he declared to The New Zealand Herald. "He's part of our family." Even if things had not worked out, he and his wife could have gone forward with clear consciences knowing in their hearts that they had done everything in their power to have saved Simon. As things joyfully turned out, Simon not only lived but has adjusted remarkably well to having just two legs. 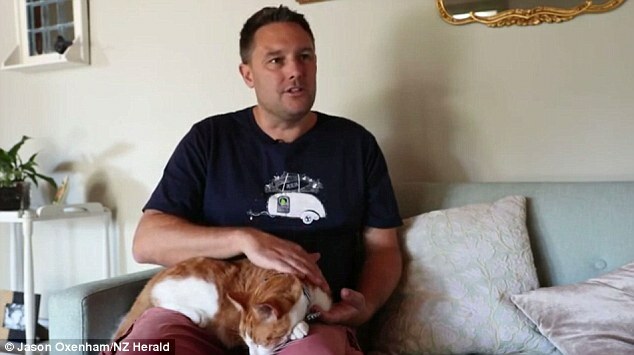 "Simon didn't mourn the loss of a second limb and reminisce about the days when he had three legs. He simply got up on two legs and got on with life," Clark told The New Zealand Herald. "We see this all the time in the animals that come to us. I think people can learn a lot from them." That is true enough as far as it goes but she egregiously fails to even take note of the all-important fact that cat owners all over the world could learn even more from the superlative example set by the McCarthys. First of all, they have demonstrated conclusively that no true lover of the species ever gives up on a moggy no matter how old, sickly, or handicapped it may be. Secondly, they have shown that no expense ever should be spared when it comes to saving a cat's life because doing so is the very best investment that anyone will ever make in this world. As the result of having chosen life over death and compassion over expediency, the McCarthys have been richly rewarded by still having Simon around in order to brighten up their lives. As wonderful as Simon's recovery has been, at least two dark clouds are hovering over his future. The most pressing of which is the presence of his neighbor's killer dog. Since the dog's owner has not had so much as the common decency to offer to pay Simon's humongous veterinary bill, that in itself suggests that the McCarthys could very well be in for further difficulties with either him or her. With that being the case, it is imperative that they either devise some means of containing Simon or never allow him out of their sight for so much as a split-second whenever he is outside. By losing two legs plus being dumped on death row at a shelter, Simon already has been put through Hell and that alone makes it highly unlikely that he is capable of withstanding much more abuse. It accordingly is not sufficient that the McCarthys have saved his life; rather, they must now endeavor to take any and all measures within their power in order to preserve it. The message is thus perfectly clear: the McCarthys cannot under any circumstances allow any of those cat-hating fiends to come within ten feet of Simon. That is an imperative because, first of all, domesticated cats are all the time mistaken as ferals and strays and subsequently killed on the spot. Secondly, collars can come off and implanted microchips are not visible to the naked eye but rather must be deciphered by scanners. Thirdly, poisoners, trappers, sharpshooters, and other killers do not discriminate on the basis of a cat's socio-economic status. After all that he has been through and so bravely transcended, the only acceptable dénouement for him would be to die a natural death in bed many years from now. All of those dark and gloomy thoughts aside for the moment, his miraculous triumph over simply outrageous misfortune is indeed something to warm the heart on this very cold and blustery St. Patrick's Day with spring, despite what the calendar says, nowhere in sight. Photos: John Oxenham of The New Zealand Herald (Simon) and the Daily Mail (Bella). "This world is not just for people." 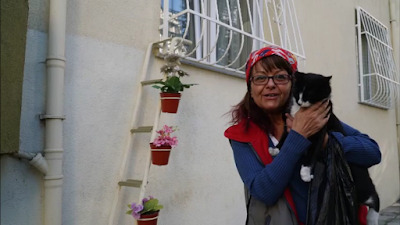 With Tekirdag suffering through an especially cold and snowy winter, Sebnem Ilhan knew that she had to do something about the many wet and homeless cats that she saw shivering outside her house every day. In particular, she desperately wanted to bring them inside but for reasons that never have been spelled out by the media she was unable to do so, at least not in any conventional manner. One possible explanation is that entry into her house is only secured via an elevator and that of course would preclude her from installing a cat flap. She could have trapped and then carried them inside but, for whatever reason, she declined to do that. In doing so, she also had the foresight to take precautions against incurring any potential problems with her neighbors. 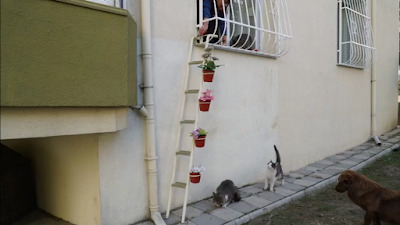 "I thought if I put some flower pots there, it (the ladder) wouldn't bother anyone," she told Yahoo News. Apparently that ploy has succeeded in not only keeping her neighbors at bay but an unspecified number of cats have availed themselves of the ladder in order to escape the elements as well as to stock up on some much needed replenishment. "I wish no animal is hungry and thirsty, just happy," she added. "This world is not just for people." Press reports, already sketchy at best, have not delved into how all of this came about but since Ilhan voluntarily rescues both cats and dogs she in all probability began by setting out food and water for the cats at ground level. After that she in all likelihood moved the food to the bottom rungs of the ladder and then, little by little, was able to lure the cats all the way to the top and eventually inside her abode. All of that sans doute required a good deal of time, effort, and patience but since she earns her livelihood by pulling teeth she is well versed in executing tedious and delicate maneuvers. Moreover, there never was any guarantee that the cats ever would catch on to what she had in mind and that is especially the case in regard to those who had spent their entire lives roughing it. Located on the northern coast of the Sea of Marmara one-hundred-thirty-five kilometers west of Istanbul in the tiny sliver of Turkey that lies in Europe, Tekirdag has a Mediterranean climate that is characterized by long, hot, and humid summers that are followed by cool, wet, and snowy winters. Although overnight lows between December and March rarely dip below 35° Fahrenheit, it either rains or snows more than a third of that time. Ladders not only are helpful when it comes to rescuing cats from the elements but they also play a vital role in assisting elderly and disabled cats to get around on their own. For example, when a handsome ginger and white male named Tom from Fulham in the London borough of Fulham and Hammersmith, located six kilometers south of Charing Cross on the north bank of the Thames, came down with arthritis that made it not only difficult but painful as well for him to scale the eight-foot garden fence that surrounds his house. At first his owner, Adrienne Ellery, did not know what to do but her thirty-five-year-old boyfriend, retired firefighter Gareth Bowen, had an idea. 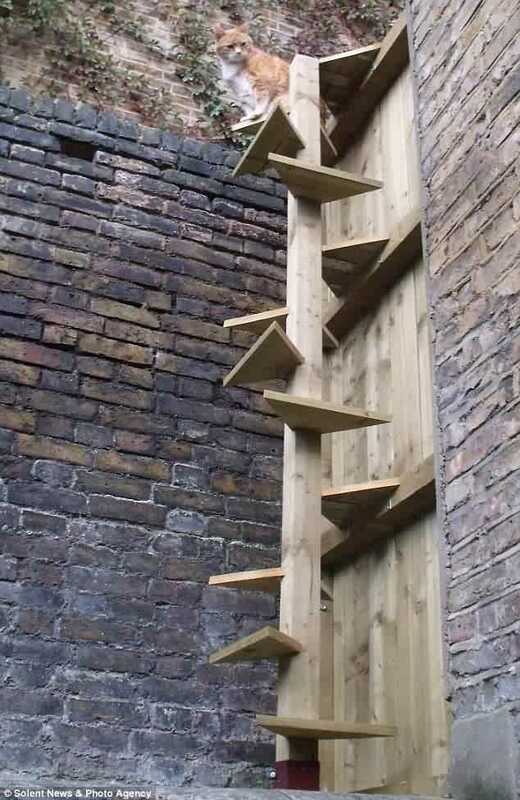 "I had some wood left over from building a fence so I started on a staircase," he later confided to the Daily Mail on September 19, 2011. 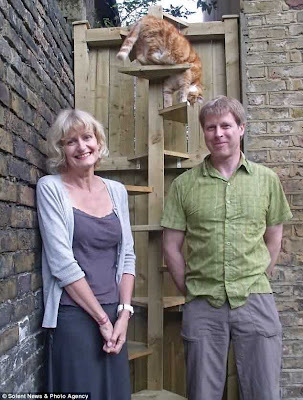 (See "It Was a Joint Effort: Arthritic Cat Is on Top of the World after Owners Build Him a Spiral Staircase to Get over Garden Fence.") "I knew Tom was an intelligent cat and would figure out how to use it." His partner was not so quickly persuaded, however. "When Gareth told me what he wanted to do I was astonished and thought he was a bit mad," she admitted to the Daily Mail. Undaunted by her skepticism, Bowen forged ahead. "I was watching Tom and it was sad to see him struggle with the fence," he added to the Daily Mail. "Some days he could do it but when he came back down he was faced with an eight-foot jump and he would land with such a thud that I knew it wasn't good for his joints, particularly with the arthritis." The end result of his labors was an aesthetically appealing twelve-rung spiral staircase that allows Tom to get up and down the garden fence. Once he reaches the summit, he is now able to navigate around the neighborhood by walking on top of the wall. It was not all smooth sailing, however, and initially it appeared that Ellery's reservations may have had some merit. "When it was finished Tom didn't know what to make of it and I was a bit worried he wouldn't figure it out," Bowen conceded to the Daily Mail. "But then Adrienne tempted him by putting some food on each step and then Tom couldn't wait to run up the stairs. It was if he had used it all his life." Ellery readily concurred. "...it's made all the difference to the cat," she declared to the Daily Mail. "It means he can get around the neighborhood and as he's getting older it's important for his quality of life." 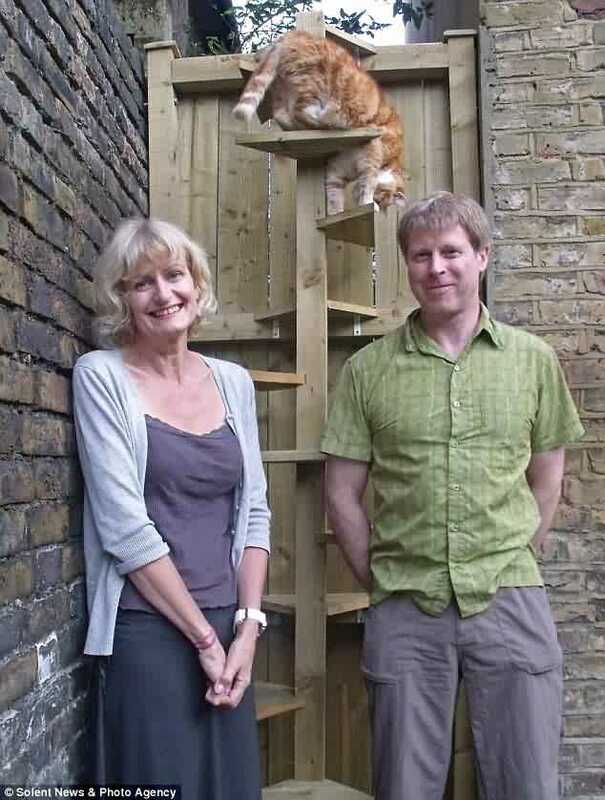 The staircase, which Gareth constructed in a single day's work, thus has improved both Tom's physical as well as his psychological health. "On the way down he jumps the last few steps as a way of proving to himself that he can still do it," Bowen concluded. "It's great because it means he's not stuck in the house and can be sociable with the other local cats." Bionic implants may one day be yet still another option for cats that have been robbed of limbs by murderous motorists and combine operators. These prosthetics consist of polymer and rubber paws that are attached to titanium rods that in turn are inserted into holes drilled into their ankles. For instance in December of last year, a handsome one-year-old homeless tuxedo named Pooh was fitted with a pair of bionic legs at the Central Veterinary Clinic in Sofia in order to replace the rear limbs that were stolen from him by either a motorist or a train engineer. "Pooh's condition is more than satisfactory," thirty-five-year-old Vladislav Zlatinov of the surgery told Yahoo News on January 28th. 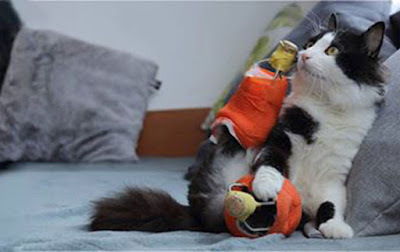 (See "Paw-fect Rescue: Bulgarian Stray Cat Gets Bionic Legs.") "There might be some clumsiness but he can walk, jump, and run. The only difference is a gentle tapping sound." Steven, an eight-month-old cat who also lost both of his rear legs last year, likewise has been fitted with a new pair of bionic legs but press reports have not disclosed how that he is progressing. Both he and Pooh were brought to Zlatinov's surgery by Let's Adopt Bulgaria of Sofia which footed the enormous bills for both operations. "We went to Zlatinov looking for a solution because he had solved other hopeless cases of injured animals before," the charity's Vyara Mladenova told Yahoo News. "But we didn't expect him to offer this solution and for it to be successful." It is believed that Pooh ("Fluff" in Bulgarian) and Steven are only the second and third cats in the world to have been fitted with bionic paws. The first one was a black tom named Oscar from the parish of Grouville in the Balliwick of Jersey who lost both of his rear appendages to a combine operator in the autumn of 2009. The reason that so few of these procedures are performed is, quite obviously, their exorbitant cost. Although Let's Adopt Bulgaria has not publicly disclosed how much that it paid Zlatinov for Pooh's and Steven's surgeries, Oscar's new limbs cost his owners, Mike Nolan and Kate Allan, a whopping £50,000. Such procedures surely must cost considerably less in Sofia, however, given Zlatinov's newfound optimism. "(The operations) give hope that even in a country like Bulgaria innovative things can be done," he proclaimed to Yahoo News. Although there certainly is not anything secretive about the technology that put Oscar, Pooh, and Steven back on their feet, there is not any record of such procedures having been performed in the United States. If that is indeed the case, it can only be attributable to Americans' legendary cheapness rather than to any lack of expertise. Even Zlatinov has reservations about bionic implants. "Cats who (have) lost one leg do pretty well. But what happens if they loose both their hind legs?" he rhetorically mused to Yahoo News. "Yes, they move somehow, but what quality of life are we talking about?" Not only is he wrong to raise such an objection, but unless a cat is in simply excruciating pain and without so much as prayer of recovering, most any kind of life is better than none. Moreover, the quality of life afforded amputees is actually quite good. For example, in Monmouth, Illinois, a black and white female named Trace has only two legs. Both of her rear ones were ground up inside a motorist's engine but Geoffrey Weech of the Monmouth Small Animal Hospital never even once considered killing her. As if any additional proof was needed, a tortoiseshell named Callie Mae at the Theodore Veterinary Hospital in the Alabama town of the same name does not have any legs at all. "She's a good kitty," Sandy Tomlin of the surgery averred to WKRG-TV of Mobile on August 9, 2010. (See YouTube video entitled "Legless Cat Ready to Start Another Life.") "She even caught a mouse one time." Killing cats that are either homeless or disabled should not be an option for any society. All of them can be saved but doing so requires, like everything else that is worthwhile in this world, time, money, and effort. Owners such and Ellery and Bowen were willing to go the extra mile for Tom as was the case for Nolan and Allan in regard to Oscar and Broomhall with Blacky. Ilhan did not harden her heart and turn her back on the homeless cats of Tekirdag and the same can be said for Let's Adopt Bulgaria and its compassionate care for Pooh and Steven. As far as Weech and the Theodore Veterinary Hospital are concerned, the kindness that they have showered on Trace and Callie Mae, respectively, can only be described as extraordinary. The imperative therefore is not contract but rather to expand the circle of care, compassion, and legal protections to all cats regardless of either their socio-economic status or the extent of their disabilities. That lofty goal is a preeminently achievable one; all that is lacking is the commitment to make it a reality. Photos: Sebnem Ilhan (ladder), Daily Mail (Tom), and Let's Adopt Bulgaria (Pooh). "Stanley provided hospital workers, ambulance staff and patients with a talking point, amusement and cuddle therapy whenever it was needed." The physicians, nurses, and assorted attendants who slave away saving lives in the Accident and Emergency Department (A&E) of the Royal United Hospital are going to have to find a new provider of their cuddle therapy. The same is equally true for their many patients as well as the department's drivers and paramedics at South Western Ambulance Service (SWAS) which serves more than five million residents in Bristol, the counties of Somerset, Cornwall, Devon, Dorset, Gloucestershire, and Wiltshire as well as the Scilly Islands. All of that upheaval and accompanying profound sadness is attributable to the untimely passing on January 18th of the department's longtime feline companion, Stanley. None of the particulars have been publicly disclosed but if past history is anything to go by he was not permitted the luxury of living out his all-too-brief existence to the very end and then dying a natural death, but rather was prematurely killed off by his owners who reside close by to the fifty-two-acre, five-hundred-sixty-five-bed facility located in the Weston section of Bath in Somerset. "He has had renal and respiratory problems for years now and we feared that even last winter he wouldn't be with us for much longer," his unidentified owner told the Bath Chronicle on January 20th. 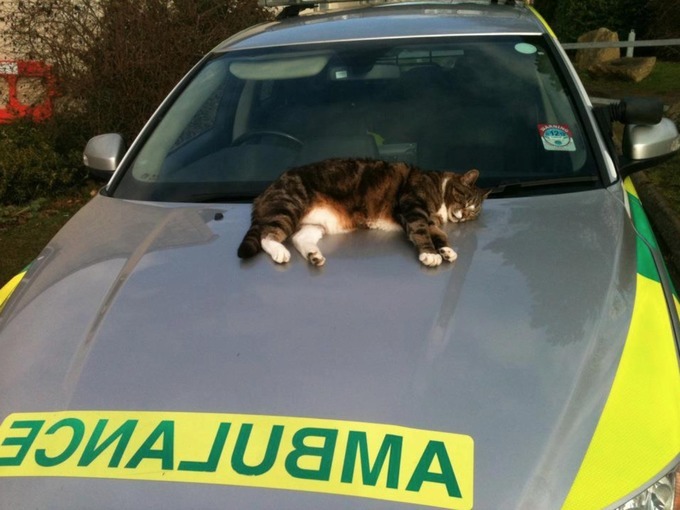 (See "Tributes Pour In for Friendly Feline Stanley Cat Who Made Bath's Royal United Hospital a Brighter Place.") "He battled through them however and I like to think this was because he wanted to share one last summer with everyone." Very little has been disclosed to the outside world concerning the handsome brown and white tom. For instance, it is not even known either how old he was at the time of his death or how long that he had been hanging out at the A&E. For its part, the Chronicle has left the latter matter obscure by reporting only that he had been visiting the hospital for "many years." During his tenure there, however, he endeared himself to staffers and patients alike by sneaking into ambulances, sleeping on stretchers and visitors' chairs, and by comforting injured patients. He was so successful in that endeavor however that a Facebook page was established in his honor that soon attracted at least nine-hundred-twenty-six devoted followers. He is gone now but that has not stemmed the outpouring of heartfelt tributes and remembrances. 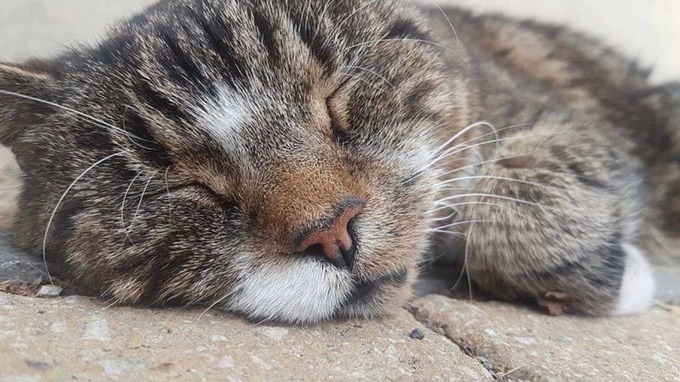 "We miss him so much already but are grateful to know he had such a wonderful and exciting life meeting lots of lovely people at the hospital and beyond," is how his owner chose to eulogize him to the Bath Chronicle. "Hopefully he made others as happy as he made us." The members of the hierarchy at the South Western Ambulance and Allied Health Branch (SWAAHB) of Unison, which represents the ambulance drivers and paramedics, also paused during their busy schedule in order to remember him. 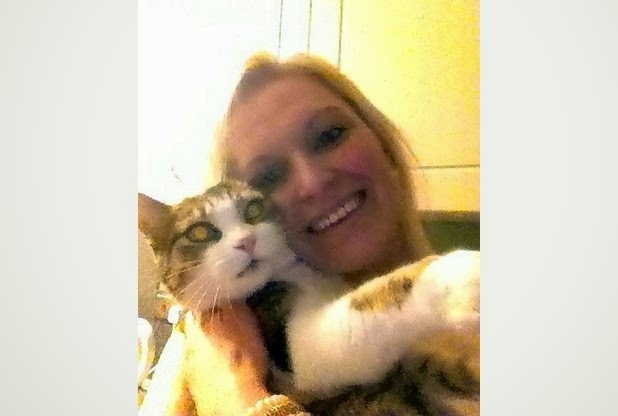 "Many of us benefited from the pet therapy that (Stanley) selflessly provided," a spokesperson for the trade union told the Bath Chronicle. "Cheerio old chap." It was perhaps SWAS worker Peter Hallett, however, who did the best job of summing up Stanley's invaluable contributions to RUH. "Stanley provided hospital workers, ambulance staff and patients with a talking point, amusement and cuddle therapy whenever it was needed," he affirmed to the Bath Chronicle. "Many times after a bad or upsetting job I had walked out of A&E for a cuddle with Stanley, his presence in itself having a therapeutic effect on staff. I for one will miss him greatly and the RUH will always be a little sadder around A&E without him there." 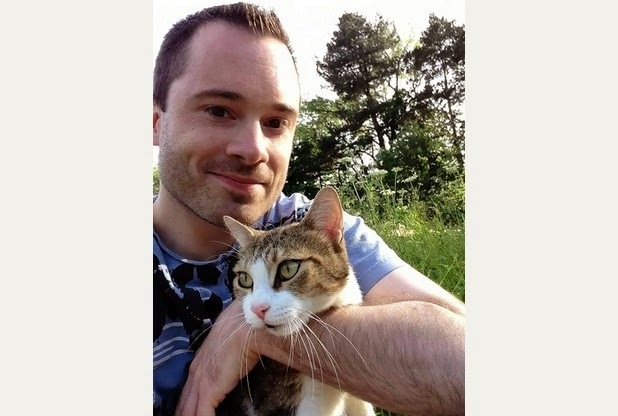 Shortly after his death, Steve Pearce started a fundraising campaign at www.justgiving.com in order to raise £400 for a memorial plaque in his honor to be erected near the A&E. "Stanley was loved by so many, he brightened up our darkest hours just by being there. Usually found just outside A&E, but whenever he could get away with it, could also be found sleeping inside, on visitors' chairs and warm corners!" Pearce wrote. "His owner had no choice, but to share him with us, it's almost like Stanley felt it was his job to look after us. He will always be remembered." That campaign proved to be so successful that by February 18th a total of £676 had been donated by eighty-one caring and generous individuals. The surplus funds in turn will be used in order to purchase a work of art to be donated to the A&E in Stanley's memory. His life and times also serve as yet still another poignant reminder that cats provide numerous health benefits not only to their owners but also to perfect strangers working and residing in hospitals and old folks' homes as well. As a consequence, more and more of these institutions are coming to the conclusion that there are good reasons for allowing cats to either temporarily visit or to take up permanent residence on their campuses. In spite of the myriad of services that cats dispense so freely to both their owners and society at large it is impossible to get around the disheartening reality that they seldom are appreciated for being, as Leonardo da Vinci once termed them, "nature's masterpiece." Far from it, more often than not they are routinely vilified as devils incarnate, systematically exterminated by the likes of the barbaric Australians, and horribly abused in so many ways by individuals, groups, and institutions. Even in Stanley's case it does not appear in hindsight that the staff at either RUH or SWAS ever fully appreciated him. On the contrary, they routinely rudely interrupted his repose in order to cruelly and unconscionably give him the bum rush whenever he dared to venture inside either the A&E or their ambulances. If any of them had really cared about his happiness and well-being they instead would have immediately dropped everything the very moment that he showed up, rolled out the red carpet, and lavished kind words and treats upon him. They callously threw away their golden opportunity, however, and now that his time has come and gone their rude and uncaring behavior toward him is forever on their consciences, that is, if they have any. Speaking more broadly, it is high time that man did an abrupt about-face and turned over a new leaf and for once in his miserable existence endeavored to be something other than the selfish and exploitative monster that he always has been throughout history. To paraphrase a famous speech delivered almost sixty years ago by John F. Kennedy, he should stop repeatedly asking what cats and other animals can do for him and instead start asking himself what he can do for them. In respect to cats, that first of all entails respecting their inalienable right to not only live but to die natural deaths as well. Secondly, they should be free from all forms of violence and abuse. Thirdly, they should be endowed with an unqualified right to security, shelter, food, water, and veterinary care. In conclusion, even once it is in situ, the plaque is destined to be a rather shabby substitute for the real-life Stanley. 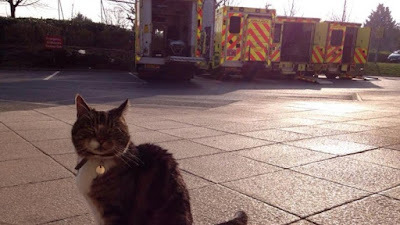 About the only thing positive that can be said about it is that it will provide cat-lovers visiting Weston with an excuse, other than a medical emergency, to visit RUH and to pay their respects. In death Stanley thus has joined the ranks of the city's other illustrious resident, the Wife of Bath, whom if Geoff Chaucer is to be believed not only ran through men like a knife cutting hot butter but also insisted that they dutifully "paid their debt" to her each night. That in turn segues into the present-day dilemma of when, if ever, is man going to wake up and pay his debt to cats like Stanley? When all is said and done, plaques, statues, and crocodile tears do not count in this world. All that matters is how that the living are treated.